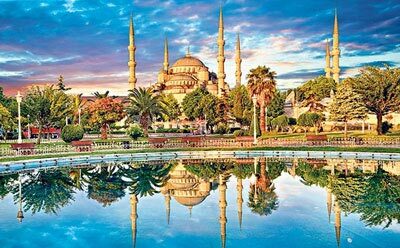 Turkey is most fascinating country. This is the only country which is half in Asia and half in Europe. One can easily distinguish the difference between Europe and Asia part. 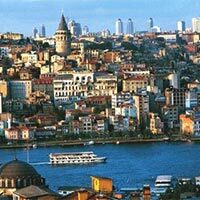 It offers many historlical places Sultanahmet, Blue Mosque, Hippodrome, Dolmabahce Palace Grand Bazar is places where you will get around 500 different shop under one roof. 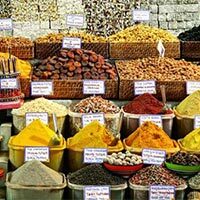 sweets & spices is one of the world’s largest spice bazaars since 1665. 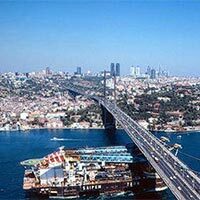 Bosphorus, the beautiful strait that divides Europe from Asia. 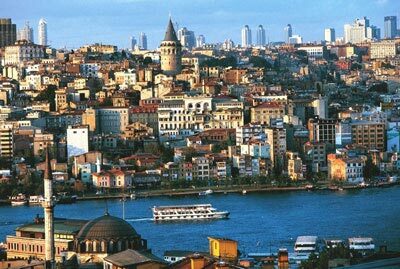 Turkey is most fascinating country. This is the only country which is half in Asia and half in Europe. One can easily distinguish the difference between Europe and Asia part. 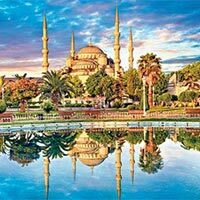 It offers many historlical places Sultanahmet, Blue Mosque, Hippodrome, Dolmabahce Palace Grand Bazar is places where you will get around 500 different shop under one roof. sweets & spices is one of the world’s largest spice bazaars since 1665. 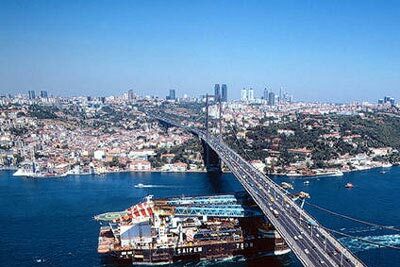 Bosphorus, the beautiful strait that divides Europe from Asia.Portages and personal expenses like telephone bill, laundry, Room services etc. Un-utilized tour inclusion are non refundable. Upon arrival in Istanbul (Ataturk Airport), the city of two continents, you will be greeted by our representative with Turkish hospitality & accompanied during your transfer to the hotel (Check-In 13:00), where you will be briefed by your travel consultant. Day free at your own or relax. Dinner at Indian restaurant without transfer walking distance from Hotel. After breakfast at Hotel. 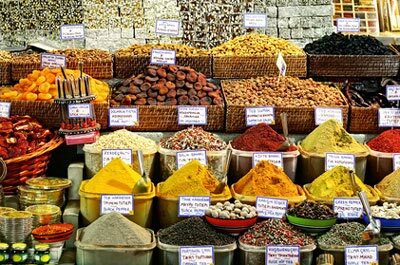 Meet your guide at hotel lobby for a short drive to Spice Market; Egyptian Bazaar heaped with various sweets & spices is one of the world’s largest spice bazaars since 1665. 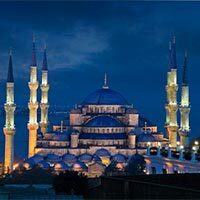 Soon after, you will visit the Suleymaniye Mosque and Then embark on the Bosphorus ferry cruise for an unforgettable cruise along the Bosphorus, the beautiful strait that divides Europe from Asia. Lunch at Dolphin Fish restaurant, After lunch break, day tour will continue with driving across the first Bosphorus Bridge & head for the summit of Camlica Hill, which offers 360° panoramic views of Istanbul overlooking the Sea of Marmara. 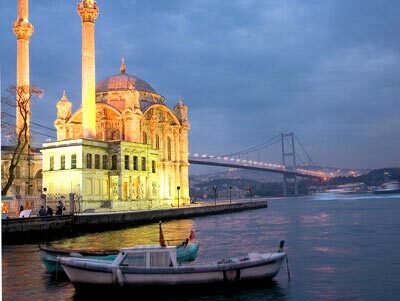 Driving back to Europe over the Bosphorus Bridge, you will visit Dolmabahce Palace (excluding harem), the imperial residence of the last six Sultans, with more than 340 rooms & 8 Turkish baths, Visit to Spice Bazar. Back to hotel. Dinner at Indian restaurant without transfer guest need to reach to restaurant at their own. After breakfast at Hotel. 09:30 Hours Meet your guide to for your full day tour to Princess Island the 1st destination is Buyukada, the largest of the island chain, but we will pass by four other islands on the way. All are famous for their mild climates, beautiful pine woods and beaches and Ottoman houses, and on all of them cars are banned. The preferred means of transportation is the charming horse - drawn carriage known as the phaeton, you may also rent bike and enjoy your ride. You will feel as though you have stepped back into a more leisured and gracious age, almost expecting gran. 19th centaury ladies and gentlemen to come strolling down to the waterfront on an afternoon promenade. 14:00 Hours Lunch will be at one of the many excellent traditional fish restaurant on the waterfront. 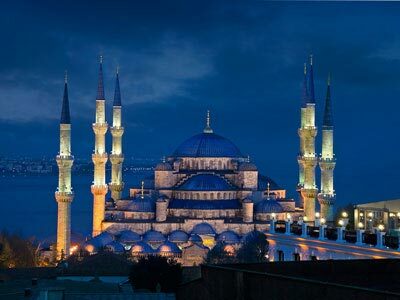 15:30 Hours Evening return back to Istanbul and transfer to your pre booked Hotel. Dinner at Indian restaurant without transfer guest need to reach to restaurant at their own. After breakfast at Hotel. Free.Free time at your own. On time transfer to airport to board the flight for back home. Cost is applicable traveling minimum 10 Pax together. All payment full in advance. Visa is subject to Dubai immigration. Change in airfare will led a change in cost. Change in currency will be charged as per rules. Tour to be booked 25 days in advance. Rates are based on Standard category of rooms. Visa requirement Original, signed India passport with at least 6 months of remaining validity. Passport - Type photograph specification 35 x 45 MM White back ground, color photo , 70 % Face enlarged Visa application form. Visa application form filled out in detail (block letters) and signed by the applicant. Itinerary. Confirmed round trip flight tickets Foreign Exchange or Credit Card copy. Applicant must provide Foreign Exchange or Credit Card copy Bank Statement. Copies of bank statements from the past 6 months signed and stamped from bank. Employment Letter. A letter from your employer/school (on business letterhead, with contact details), stating that a leave of absence has been granted and that you will be returning to your current job. If you are self-employed, include a copy of your business license and tax return. If you are retired please submit proof of your retirement fund. Confirmed Hotel Reservations. Copy of the Hotel Reservations, OR Personal Invitation. If visiting friends or family, you must provide letter of invitation with the contact information of the host and visitor, purpose and duration of the visit, confirmation of accommodation including the address, signature and date. You will also need to provide proof of the host's status in Turkey i.e. copy of their Turkey passport's information page, or, if they are not a citizen of Turkey, copies of their Turkey residence permit and their national passport's information pages. Personal Letter. A personal letter from the applicant addressed to the Embassy of Turkey, explaining the purpose of the trip, dates of travel, cities to be visited, and place of accommodation.